Ed Oliver Golf Club was built on the original site of the Wilmington Country Club. Wilfred Reid designed the original layout that was later redesigned twice, first by Alfred Tull, and later by Edmund Ault. Since the final redesign by Mr. Ault in 1971, the layout has essentially remained the same. Included below is a biography of the golf course architects responsible for what is now today, Ed Oliver Golf Club. DIED: West Palm Beach, Florida, at age 89. Wilfred studied club and ball making under Tommy Armour’s father, Willie, in Edinburgh, Scotland. A scratch golfer at 15, Wilfred turn professional at 17 and was a protégé of Harry Vardon who helped him land a club professional job in Paris, France, in the early 1900’s. Reid was a fine competitive golfer despite his diminutive size, and he beat his mentor, Vardon, on several occasions. Reid competed in the United States during several seasons before moving there at the behest of the DuPont family after the outbreak of World War I. 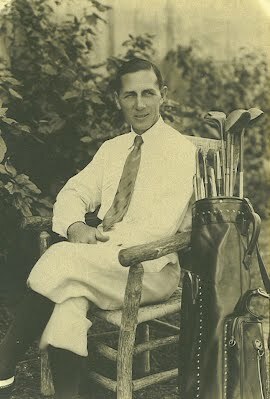 He became a member of the PGA in 1917 and obtained U.S. citizenship in 1921. Reid served as a professional at several of America’s top clubs, including Country Club of Detroit, Beverly Country Club, The Broadmoor and Seminole Golf Club. He defeated Gene Sarazen in the 1924 Augusta Open, won the 1926 Michigan PGA and has twenty-six holes-in-one in his long-playing career. Reid began designing golf courses at an early age and laid out courses in Europe and Britain before settling in the United States. He once estimated that he had designed fifty-eight courses and remodeled some forty-three others during his design career. While based in Michigan during the 1920’s, he partnered with another club professional, William Connellan. The firm of Reid and Connellan designed some twenty courses in that state alone. Reid retired to Florida in the early 1950’s and consistently bettered with age in both social and competitive rounds. In 1985 Reid was post-humously inducted into the Michigan Golf Hall of Fame. California, Delaware, Michigan. In addition he designed courses in England and France. In 1924, however, Alfred Tull joined Emmet as a design associate and became a full partner in 1929 in the firm Emmet, Emmet and Tull. Following Emmet’s death in 1934, Tull entered private practice as a course architect. Clients and others he worked with were struck by Tull's remarkable ability to lay out individual holes and establish a circuit by walking the land and staking holes with resort to topographical plan. Later he would place his circuit on a topo to convey his ideas to others. Edmund Ault studied construction engineering at Columbia (Md.) Technical Institute and for a time was employed in that field. He then trained for several seasons with golf architect Fred Findlay and entered private practice as a course designer in 1946. For several years in the late 1950’s he partnered with club professional Al Jamison. A onetime scratch golfer, Ault played in the National Amateur on several occasions. He served in the Green Section of the USGA, was a past president of the District of Columbia Golf Association and chaired the design Standards Committee of the American Society of Golf Course Associates (ASGCA). Long an advocate of flexibility in courses, Ault pioneered the systematic coordination of pin placements with tee marker locations. A most prolific designer, Ed Ault once estimated that he had designed or remodeled one quarter of all courses in the Maryland and Virginia suburbs around Washington, D.C.
Ault was made a Fellow of the ASGCA in 1984. That same year he reorganized his company by forming a partnership with his son Brian and Tom Clark, both longtime design associates. 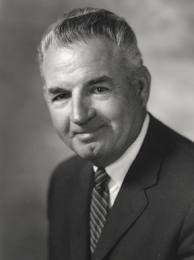 Ault continued to actively design courses as a member of Ault, Clark and Associates until his death in 1989.